This is “Speaking via Electronic Media”, section 12.4 from the book A Primer on Communication Studies (v. 1.0). For details on it (including licensing), click here. Identify strategies for speaking on radio and television. Describe the communication skills necessary to be a spokesperson. Explain the role of crisis communication professionals. My current university has rather well-established radio and television broadcasting programs for our students. We have a television station and a radio station that undergraduate students interested in careers in broadcasting get to actually work in to gain experience and hone their skills. At the start of each semester there are some definite rough spots—for example, as I watch a broadcast meteorology major make his or her first appearance in front of the green screen weather map or listen to a radio broadcasting student deliver the hourly news update on the radio. But it is wonderful to be able to watch these young broadcasters improve over the course of the semester, some of them growing to rival the seasoned reporters on our regional network stations. Although many people think of radio as an old-fashioned form of media, it is still important in many aspects of life and continues to adapt to changing markets, expanding to include Internet and satellite formats. People may think radio is as easy as sitting in a chair and talking into a microphone, but it takes practice and verbal and nonverbal skills to effectively communicate on the radio.Stuart W. Hyde, Television and Radio Announcing, 4th ed. (Boston, MA: Houghton Mifflin, 1983), 19–21. Aside from reading over words without stumbling and ad-libbing content as needed, speaking on the radio requires communicators to interpret and emphasize using their voice. Even though radio is sound only, nonverbal communication is still important. The audience can’t see your gestures and facial expressions, but using them makes the verbal delivery more engaging and effective. Although the radio reaches thousands of people at a time, radio presenters should imagine that they are connecting with individuals as they speak. Some people, including me, have “mic frightIncreased nervousness due to the presence of a microphone.,” which is increased nervousness due to the presence of a microphone.Stuart W. Hyde, Television and Radio Announcing, 4th ed. (Boston, MA: Houghton Mifflin, 1983), 52–57. I actually didn’t realize that I had mic fright until the first time I was interviewed on the radio. Even after many years of public speaking experience and skill and confidence development, sitting in a radio booth with headphones on and a big microphone in front of me brought on communication anxiety like I hadn’t experienced in years. Luckily my segment was recorded to tape, so by the time it aired it had been edited and I didn’t sound as nervous and incoherent as I felt in that moment. To help avoid nervousness, practice with a microphone just so you’re used to seeing it. Some people’s nervousness stems from a dislike of hearing their own voice. Many people don’t like the way they sound when recorded, but that’s the way we actually sound and the way others hear us, so it’s important to get used to hearing our own voice. When we normally hear our voice, we hear what comes out of our mouth and is conducted through the air but also the internal resonance and vibration that happens as our voice is conducted through the bones and structures of our head and neck. Other people only hear the way our voice sounds as conducted through air without the added effect of the bone resonance. So, when we hear ourselves recorded, we hear our voice as others hear it, because the recording only captures the air and not the bone vibrations. We may not like it, but everyone else is already used to hearing it that way, because they’ve never heard our voice the way we hear it. Here are some final tips for radio communication. Be aware of microphones, and follow instructions for how close or distant your mouth should be from a microphone and what kind of volume you need to use. Avoid rattling papers, popping consonant sounds like p, or breathing directly into a microphone. Watch your verbal fillers, even more noticeable on the radio than they are in person or on the television. Many professional radio and television announcers practice a version of American English that doesn’t give away any regional affiliation. Unless you are doing this for a career, you do not need to try to change an accent or dialect, as that will probably make you sound strange. Just speak in a natural voice, but make sure to articulate and enunciate your words so you can be understood. You don’t have to be famous to be on television. People are often surprised to find themselves in a situation where they will be on camera. Although many people in the digital generation are used to being recorded via webcam or even on a smartphone, being in front of a television camera creates a completely different atmosphere. Since television is a visual medium, appearance is important. In terms of clothing, avoid too much contrast between colors, like black on white. Also avoid clothing that is too striped or patterned, as it may bleed onscreen.Bruce Lewis, The Technique of Television Announcing (New York, NY: Hastings House, 1966), 53. Keep in mind that jewelry, watches, or anything reflective may catch the studio lights and create a distracting glare on camera. Also avoid wearing colors that are close to your skin tone.Stuart W. Hyde, Television and Radio Announcing, 4th ed. (Boston, MA: Houghton Mifflin, 1983), 66–68. You may be offered makeup; if you are, take it. Once you are on set, you’ll need to orient yourself to the surroundings. Hopefully there will be a producer or other staff person there to explain things to you. You will want to be aware of video and audio monitors. Video monitorsTelevisions that allow on-air people to monitor their movements and see what viewers are seeing. are televisions that allow the on-air person to monitor their movements and see what viewers are seeing. One usually shows the video feed exactly as it will appear on viewer’s screens and one may be a fixed monitor that basically functions as a mirror so you can see that you are framed properly and look all right. Avoid the common temptation to stare at or constantly check the monitors. In terms of audio, there may be a lavaliere microphone that will be attached to you beforehand. In some situations you may also get an audio monitorSpeaker or earpiece that allows a person on television to hear himself or herself, studio producers, or another person communicating from off-site. that allows you to hear yourself, studio producers, or another person communicating with you off site. If off-camera producers need to communicate with you, the monitor may be an earpiece, which is standard for news anchors. If you are doing a remote live segment, the sound monitor will likely be a simple speaker. You may be asked to do microphone, sound, and video checks. Just follow the instructions, but make sure to speak up if something doesn’t seem to be working right. You want to make sure you can hear and see what you need to. 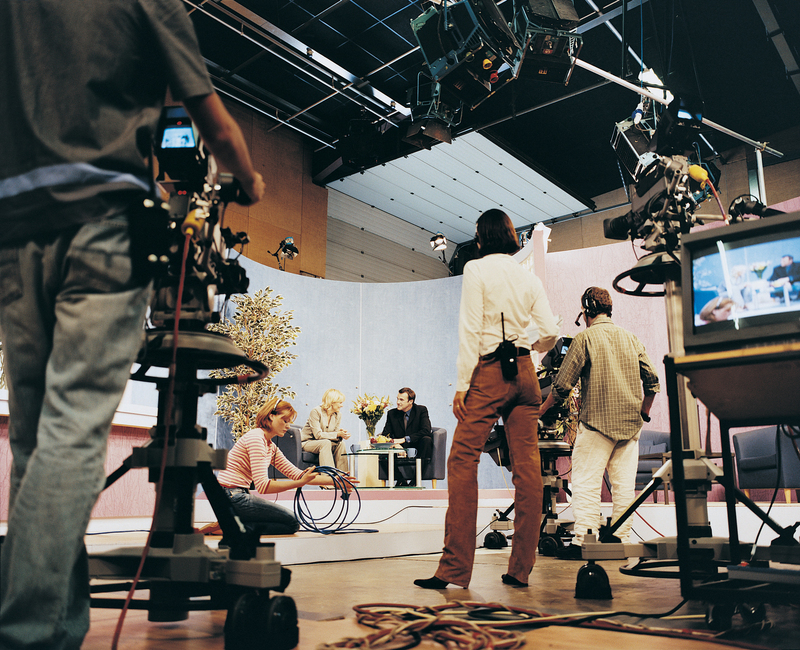 Television studios are fast-paced, technical environments that can make speakers very nervous if they aren’t prepared. It’s OK to practice what you’re going to say aloud a few times before you actually present. People in television studios are used to on-air announcers and reporters walking around talking to themselves. As with radio, think about the audience you’re reaching as individuals rather than a mass of people. Develop a mental picture of a definite person watching, which will help you create the illusion of a personal connection to the viewer.Bruce Lewis, The Technique of Television Announcing (New York, NY: Hastings House, 1966), 74–89. I’m sure we’ve all been drawn into that illusion many times, even though we know better. As a fan of Brian Williams and the NBC Nightly News, I catch myself saying goodnight to Brian after he says goodnight to me (and a few million other people) at the end of his broadcast. Once the recording begins, become your own director by monitoring your communication.Bruce Lewis, The Technique of Television Announcing (New York, NY: Hastings House, 1966), 81–90. Do not monitor yourself so much that you get stuck in your head, worrying about the camera, the monitor, and where to look to the point that you forget to use even normal facial expressions and vocal variety. Remember that your face conveys your thoughts and emotions, sometimes without you knowing it. Don’t try to impersonate other people’s facial expressions and tone of voice, because it will probably come off as an imitation, rather than as genuine. Hand motions should be a little slower on television than in real life, but don’t overthink them either. Remember to keep your head up as much as possible, so only divert your eyes down to review notes; don’t let your whole head turn down. Avoid extra movements and stay on your mark if you are given one. A mark may be made using tape on the floor and indicates where you should stand. If a camera is zoomed in, even a small movement can take you out of the frame or out of focus. Movements can also take you out of set lighting or a sound area. When speaking to someone else on camera, you will need to “cheat out” a little, which may seem awkward in person but will look fine on camera. When we talk to someone, we usually face him or her directly, but on television that would leave us with only a profile shot. Each person should be at about a 25-degree angle from each other so they can see and talk to each other but also be open to the camera. When addressing the camera, look at the lens and focus about a foot behind it, because that creates the illusion that you are looking at the viewer.Stuart W. Hyde, Television and Radio Announcing, 4th ed. (Boston, MA: Houghton Mifflin, 1983), 56–62. If you are going to be presenting to more than one camera, be prepared to shift your focus. You will usually get a cue from a producer and can then follow the “tally light,” which is the red light above the camera. Producers usually give these signals very close to the camera, but you will need to rely on your peripheral vision and not let your focus be shifted to the signaler. You do not need to send a message back, nonverbally or verbally, that the signal has been received.Stuart W. Hyde, Television and Radio Announcing, 4th ed. (Boston, MA: Houghton Mifflin, 1983), 66. At the end of a television segment, especially a live one, you may have to hold a position as a segment is tossed to another presenter or there is a transition to a commercial break. Don’t assume you are off the air until someone tells you. You don’t want to end up with a blooper where you say something embarrassing or start to get up before you are off camera. It may feel like an eternity, but be prepared to hold your position for a few moments while looking into the camera, at the monitor, or at another person. People often appear on the radio or television as a result of participating in a media interviewCommunication with a reporter or radio or television representative. with a reporter or radio or television representative. Handling a media interview is also something that many people aren’t prepared for. Unless you are responding to a crisis situation, which we will discuss later, you will likely have time to prepare for a media interview. Make sure to use this time. If you are contacted by a reporter or station representative to schedule an interview, the first thing you should do is ask some preliminary questions to help with your interview preparation. Questions to Ask before a Media InterviewKC Associations, “10 Tips for Effective Media Interviews,” accessed March 17, 2012, http://www.kc-associates.com/vantagepoint/article_2.html. How can I access some of this person’s previous interviews? What is the segment or show I will be featured on? Will the interview be live? If the interview is being recorded and edited, how long will the aired segment be? Is there a deadline for the story? If the interview is part of a series, you may also ask whom they’ve already talked to and what information they have already gotten.Tom Wadsworth, “Secrets of the Media Savvy: Best Tips for Media Interviews,” asaecenter.org, April 2005, accessed March 17, 2012, http://www.asaecenter.org/Resources/whitepaperdetail.cfm?ItemNumber=12239. Don’t feel like you have to begin the interview right away or agree to the interview on the spot. You can ask the person to give you a little time to prepare and then get back in touch with them. Once you have gotten some preliminary information, do some research on the interviewer and the organization he or she represents. If the interview is about a personal context, then you have more freedom with your content. If you are representing a company or organization, you will want to contact your supervisor before accepting an interview. Many companies have policies about who can speak to the media, and some even have communications departments or designated speakers that they assign to such roles. If you are given approval to do the interview, you will probably want to run your content by your supervisor for approval as well. Then come up with two to three key messages or main points that you want to convey in the interview. Interviews that aren’t live are usually edited, and only some of what you say will make it into the final cut. Due to time constraints, media interviewers are often looking for the “sound biteA verbal bullet point that is about ten seconds or twenty-six words long.”: a verbal bullet point that is about ten seconds or twenty-six words long. While this can be frustrating, especially when you’re discussing a complicated and contextual topic, it is a media reality. Think of a sound bite as a verbal bullet point for your speech. A Good Sound BiteTom Wadsworth, “Secrets of the Media Savvy: Best Tips for Media Interviews,” asaecenter.org, April 2005, accessed March 17, 2012, http://www.asaecenter.org/Resources/whitepaperdetail.cfm?ItemNumber=12239. So narrowing your content down to these few main points and then identifying some key sound bites within the points will ensure that at least some of the important material will make it into the story instead of something you get sidetracked onto. Many people doing television or radio interviews are afraid of creating dead air and say more than they need to, which can get the interview off track. When interviews get off track, you may only be able to address one of your three main points—remember television and radio segments are usually short. The interviewers are more afraid of dead air than the interviewee is, and it’s their job to worry about it, so you can stop answering the question once you’ve addressed it and let them make the next move. Be concise in your answers to the interviewer’s questions. If they need more information, they will ask follow-up questions. If an interviewer tries to get you “off message,” be prepared to briefly engage the question and pivot back to your prepared content; in some cases, it is even OK to deflect the question by saying something like “That’s not really what I thought we were going to talk about today. I’m here to discuss…” Although politicians often dodge legitimate questions, you can watch them interact with the press for pointers on how to pivot and stay on message. If you don’t know the answer to a question, say so, but offer to follow up if the question is relevant to your expertise and experience or refer the interviewer to someone else who may have the answer. Don’t answer a question with “No comment,” as that arouses suspicion. It is OK to tell an interviewer that their question falls outside of your area of expertise, falls outside of the scope of the interview as you understood it, or gets into issues of privacy that you cannot discuss due to ethics or policy. Interviewers, especially if they are reporters, are good at making you feel like you are only talking to them. While this is true in the case of the interview, don’t forget that you are actually talking to a larger audience of viewers and/or listeners, so keep them in mind. After the interview, ask the interviewee what they are likely to use in the final segment. You may also want to follow up with a written record of any specific facts, especially if it’s technical or needs to be precise. Some careers specifically involve speaking on behalf of others. For example, spokespeople, crisis communicators, and other public relations professionals speak for other individuals or organizations. Many organizations do not have designated spokespeople, so you may just find yourself speaking on behalf of others because you were asked or told to. This section explores specific communication skills and knowledge that are useful when speaking for others. Organizations that do not have public relations or communications departments may tap someone as needed to interact with the media or release a statement. SpokespeopleSpeakers who communicate with external audiences, primarily the media, on behalf of an individual or group. speak to external audiences, primarily the media, on behalf of an individual or group. Some key attributes for an effective spokesperson are the abilities to establish rapport, tell an engaging story, handle difficult and unexpected questions, respond to nonverbal cues, and adjust communication to match audience preferences.SpokesComm, “Key Spokesperson Skills,” accessed March 17, 2012, http://www.spokescomm.com/id65.html. Ideally, spokespeople facilitate a question-and-answer session after they present their statement. We have all seen people read prepared statements and then retreat without addressing questions, which usually creates a negative impression. Spokespeople must maintain their credibility, and being open is a way to do this. A spokesperson must be perceived as credible to effectively deliver the message of another person or group. Being an effective spokesperson requires training and preparation.Barbara Gibson, “Spokesperson Coaching Tips,” SpokesBlog, accessed March 17, 2012, http://spokesblog.wordpress.com/category/spokescomm. Spokespeople should be evaluated and assessed in simulations to help prepare for delivering actual messages. Once a spokesperson is in the job, a debriefing should follow every interview to evaluate strengths and weaknesses. As with many other types of presentations, watching a video recording for evaluation purposes can be instructive. Some spokespeople are communications professionals who have general training in communication skills. There are also subject matter experts who serve as spokespeople. These speakers are useful when dealing with complex information, but they should also be trained in communication skills—content knowledge is not enough to be a good spokesperson. Speakers who are subject matter experts should avoid acronyms and other forms of insider language and be able to convey their message in concrete terms. It may be useful to pair a subject matter expert up with a communication expert and have the communication expert set up the interview and then turn it over to the subject matter expert. Crisis communication is a fast-growing field of study within communication studies as many businesses and organizations realize the value in finding someone to prepare for potential crises, interact with stakeholders during a crisis, and assess crisis responses after they have occurred. Crisis communicationCommunication that occurs as a result of a major event outside of normal expectations that has potential negative results, runs the risk of escalating in intensity, may result in close media or government scrutiny, and creates pressure for a timely and effective response. occurs as a result of a major event outside of normal expectations that has potential negative results, runs the risk of escalating in intensity, may result in close media or government scrutiny, and creates pressure for a timely and effective response.Alan Jay Zaremba, Crisis Communication: Theory and Practice (Armonk, NY: M. E. Sharp, 2010), 20–22. Some examples of crises include natural disasters, management/employee misconduct, product tampering or failure, and workplace violence. The need for crisis communication professionals is increasing, as various developments have made organizations more susceptible to crises.W. Timothy Coombs, Ongoing Crisis Communication: Planning, Managing, and Responding, 3rd ed. (Los Angeles, CA: Sage, 2012), 14. Since the 1990s, organizations have increasingly viewed their reputations as assets that must be protected. Whereas reputations used to be built on word-of-mouth communication and one-on-one relationships, technology, mass media, and now social media have made it easier for stakeholders to praise or question an organization’s reputation. A Facebook post or a Tweet can now turn into widespread consumer activism that organizations must be able to respond to quickly and effectively. In addition, organizations are being held liable for “negligent failure to plan,” which means that an organization didn’t take “reasonable action to reduce or eliminate known or reasonably foreseeable risks that could result in harm.”W. Timothy Coombs, Ongoing Crisis Communication: Planning, Managing, and Responding, 3rd ed. (Los Angeles, CA: Sage, 2012), 16–17. Look around your classroom and the academic building you are in. You will likely see emergency plans posted that may include instructions on what to do in situations ranging from a tornado, to a power outage, to an active shooter. As a response to the mass shooting that took place at Virginia Tech in 2006, most colleges and universities now have emergency notification systems and actively train campus police and faculty and staff on what to do in the case of an active shooter on campus. Post–Virginia Tech, a campus’s failure to institute such procedures could be deemed as negligent failure to plan if a similar incident were to occur on that campus. Crisis communicators don’t just interact with the media; they communicate with a variety of stakeholders. Stakeholders are the various audiences that have been identified as needing information during a crisis. These people and groups have a “stake” in the organization or the public interest or as a user of a product or service. Internal stakeholders are people within an organization or focal area, such as employees and management. External stakeholders are people outside the organization or focal area such as customers, clients, media, regulators, and the general public.Alan Jay Zaremba, Crisis Communication: Theory and Practice (Armonk, NY: M. E. Sharp, 2010), 30–31. Four main areas of crisis communication research are relationships, reputation, responsibility, and response.Alan Jay Zaremba, Crisis Communication: Theory and Practice (Armonk, NY: M. E. Sharp, 2010), 32–33 Relationships and reputation are built and maintained before a crisis occurs. Organizations create relationships with their stakeholders, and their track record of quality, customer service, dependability, and communication determines their reputation. Responsibility refers to the degree to which stakeholders hold an organization responsible for the crisis at hand. Judgments about responsibility will vary depending on the circumstances of a crisis. An unpreventable natural disaster will be interpreted differently than a product failure resulting from cutting corners on maintenance work to save money. Response refers to how an organization reacts to a crisis in terms of its communication and behaviors. Crisis communication professionals create crisis communication plans that identify internal and external audiences that need information during crisis events. Effective crisis communication plans can lessen the impact of or even prevent crises. Aside from preparing for crises and identifying stakeholders/audiences, crisis communicators also construct the messages to be communicated to the stakeholders and select the channels through which those messages will be sent. The crisis communicator or another representative could deliver a speech or press conference, send messages through social media, send e-mail or text message blasts out, or buy ad space in newspapers or on television.Alan Jay Zaremba, Crisis Communication: Theory and Practice (Armonk, NY: M. E. Sharp, 2010), 23. Crisis communicators must have good public speaking skills. Communicating during a crisis naturally increases anxiety, so it’s important that speakers have advanced skills at managing anxiety and apprehension. In terms of delivery, while there will be times when impromptu responses are necessary—for example, during a question-and-answer period—manuscript or extemporaneous delivery are the best options. It is also important that a crisis communicator be skilled at developing ethos, or credibility as a speaker. This is an important part of the preparatory stages of crisis communication when relationships are formed and reputations are established. The importance of ethos is related to the emphasis on honesty and disclosure over stonewalling and denial. A myth regarding crisis communicators is that their goal is to “spin” a message to adjust reality or create an illusion that makes their organization look better. While some crisis communicators undoubtedly do this, it is not the best practice in terms of effectiveness, competence, or ethics. Crisis communication research and case studies show that honesty is the best policy. A quick and complete disclosure may create more scrutiny or damage in the short term, but it can minimize reputational damage in the long term.Alan Jay Zaremba, Crisis Communication: Theory and Practice (Armonk, NY: M. E. Sharp, 2010), 111. Denying a problem, blaming others instead of taking responsibility, or ignoring a problem in hope that it will go away may actually prolong media coverage, invite more investigation, and permanently damage an organization’s image. Why do you think extemporaneous and manuscript delivery are the preferred delivery methods for crisis communicators? What do these delivery styles offer that memorized and impromptu do not? In what situations would it be better to have a manuscript? To deliver extemporaneously? Consider the following scenario, which we all hope we will never encounter: Several reports come into the campus police station that gunshots were heard outside the administrative building on campus. Eyewitnesses say that an unidentified armed person was seen walking into the building. Answer the following questions based on what you have learned about crisis communication: Who are the internal and external stakeholders in this situation? As a student (and stakeholder), what steps would you want your organization to take in response to this situation? What message should be sent? To whom should the message be sent? What media channels should be used? Although radio and television are mass-communication media, presenters should imagine that they are speaking to select individuals rather than a mass crowd. Radio and television try to create the illusion of a personal connection between the speaker and audience. Since television is a visual media, appearance is important. Certain types of clothes, makeup, and accessories are preferred for people presenting on air. Be prepared to work with audio and video monitors to help make sure you can see and hear what you need to while you are presenting. Avoid extra movements once you are put on your mark, as camera angles, lighting, and sound may be set to cover only a limited area. 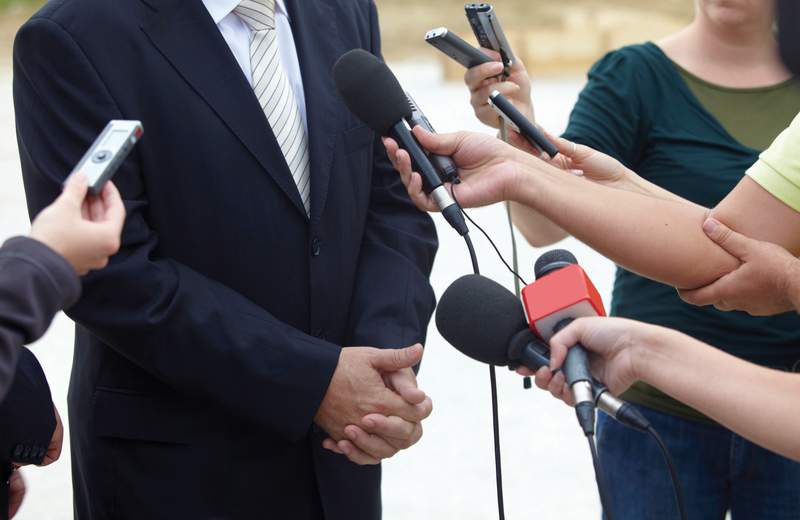 Ask questions before a media interview to ensure that you can be adequately prepared. Come up with two to three key messages and some relevant “sound bites,” and then stay on those messages during the interview. Spokespeople need to be good at establishing rapport, storytelling, and managing their nonverbal communication. Even though spokespeople deliver other people’s messages, they should be involved in drafting the wording of the messages so their communication sounds natural and not forced. As organizations realize the increasing value of their reputations and the power of social media to rapidly enhance or destroy a reputation, they are more frequently employing crisis communication professionals who prepare for before, coordinate the response during, and assess an organization’s response after a crisis. Have you ever spoken on the radio or television? If so, how did your experiences match up with the content of this section? If not, what would you be worried and/or excited about? Come up with three good “sound bites” related to the current speech you’re working on. Make sure to follow the guidelines for a good sound bite outlined in this section.